Second vote, second podium, but in this stadium's case you can see it's more of an upset than success. Why? 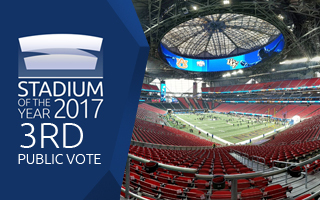 Mercedes-Benz Stadium isn't only the most expensive stadium built to date, it's also one of the most impressive sports venue concepts ever conceived. The architecture delivered by HOK isn't just compliant with the brief they were given, it's also mesmerizing to people around the world, even if found somewhat excessive by part of our Jury. If there is anything like a 'wow factor' in stadium design, this stadium has got it. 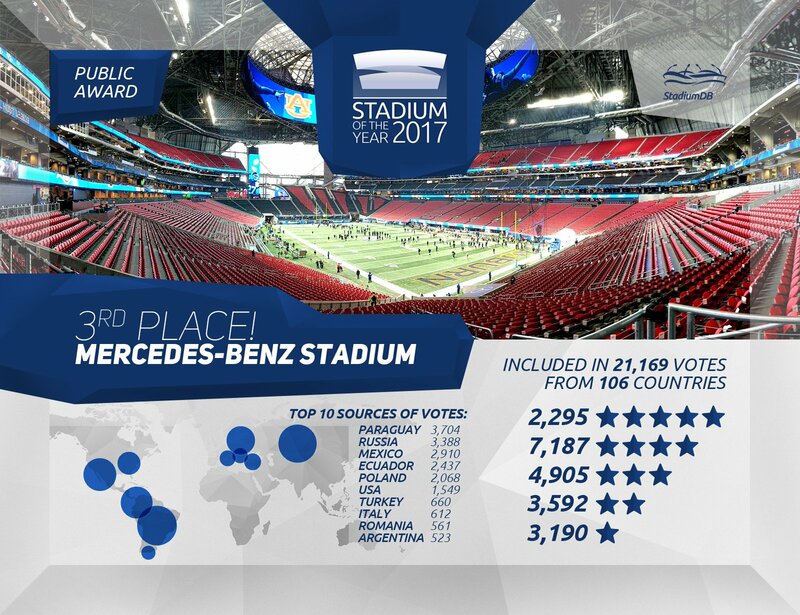 In case you need proof, it was the single candidate in this year's edition of Stadium of the Year that enjoyed the largest number of individual votes. It was selected in the 'top 5' by 21,169 people from 106 countries [as identified by IP]! It's the preferred second choice for most voters, with 7,187 4-star ratings given. This sounds like information about the winner, not third best stadium, right? But Mercedes-Benz Stadium lacked one thing. Interest at home. As with all potential favourites, we made sure to reach out to teams, stadium operator, local/regional media and supporter groups of both Falcons and United and give them a fair chance if they wished to participate. And, in an unprecedented case... nothing. We were met with various reactions, ranging from simple lack of interest to outright displeasure with the stadium itself. What we in Europe (well, us at StadiumDB at least) missed over the past few months are repeating issues with the stadium (nothing major, yet causing negative coverage) and noticable criticism of its funding, even if only partly from taxpayer money. In a unique case this 3rd place is owed primarily to people from Paraguay, Mexico, Russia and Ecuador. Still, a sign that the stadium is considered attractive regardless of location!